Cherry Tomato Recipes. Cherry tomatoes are a smaller, thumb tip sized variants of tomatoes that are popular all over the world. These are super easy to grow and that’s why many people prefer to grow them in their homes too. Taste-wise they are juicier and sweeter than the regular plum tomatoes and available in many colors like yellow, green and red. Since they are perfectly bite sized, they are all the more fun to eat. The tiny shape of the tomatoes makes it really easy to consume and also to be added to different dishes as a topping. Ricotta and Cherry Tomato Crostini is a classic example of how a simple dish can also taste delicious when you add cherry tomatoes to it. The slight sweetness of the ricotta with the tanginess of tomatoes and flaky sea salt can be enjoyed alongside a hot soup on a winter's day! The juicy tomatoes make a wonderful addition to hot and cold salads as well. Since they stay well even after being cooked, they can be added to many school and office lunch salads. The different kinds of salads can have different ingredients. A Quinoa Avocado Veg Salad with a garlic, lemon dressing is not only rich in fiber, but is also rich in antioxidants due to the cherry tomatoes. The Greeks too added the tiny tomatoes to the classic Greek Salad for a pop of color and juicy bite along with romaine lettuce and other ingredients. The tiny flavor bombs forms taste amazing as a topping on both, an open sandwich and pizzas, one of my favorite being Mini Pizza with Olive, Jalapeno and Cherry tomatoes. Cherry tomatoes are a fairly simple ingredient that are added to simple dishes but sometimes you can add them to dishes that might totally surprise you. For example, Khatte Aloo, a potato curry that is both slightly bitter and tangy is perked by various masalas and juicy cherry tomatoes cooked with the subzi. An ingredient that can never taste wrong with cherry tomatoes is the salty, crumbly feta cheese. Baked Herbed Feta Cheese with bread served along with cherry tomatoes to cut through the saltiness of the cheese is innovative and extremely delicious. 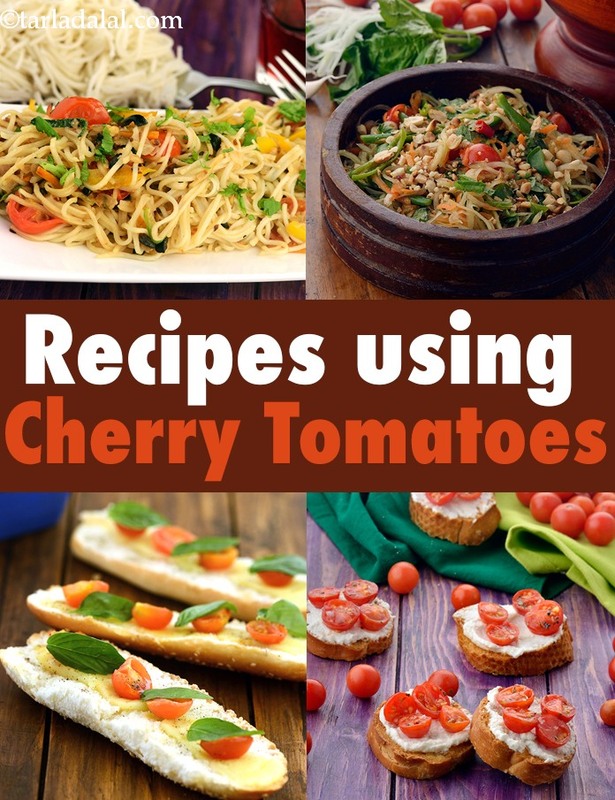 We hope you like this collection of Cherry Tomato Recipes. Scroll down below for more. Shredded spinach torn lettuce, crunchy bread sticks, bean sprouts and cherry tomatoes are tossed in with a yummy honey-lemon juice and spring onion dressing. Crunchy in every spoonful, just ensure you eat it immediately after the dressing is mixed in. Enjoy! A touch of the Mediterranean on your barbeque. Basil and garlic complement tomatoes beautifully to create this simple but stunning dish. Select firm and ripe tomatoes for best results. Pineapple and cucumbers tossed with coriander and lemon juice furnish a storehouse of fibre. Honey imparts a delicate sweetness to this tangy salad. Rather than serving it as an occasional treat, make this sweet and sour salad a part of your daily meal and say goodbye to constipation! This oregano-flavoured, tangy, crunchy macaroni salad is an evergreen favourite with pasta lovers. Paneer and bean sprouts add to the protein quotient of this salad, which is dressed in an interesting combination of herbs, garlic, chilli flakes, pine nuts and lemon juice. The walnut vegetable pate serves as an interesting appetizer. Subtle flavour of garlic mingled with walnuts and vegetables to make a delectable pâté. Feta cheese, onions, tomatoes, cucumber, lettuce, olives, and parsley are combined and drizzled with roasted garlic dressing. A small portion of the salad is placed over grilled pita triangles to make a quick salad.